Great Plague of London Enquiry. The Great Plague is taught to Key Stage 3 pupils and often forms part of a 1-9 GCSE History unit on the history of Medicine. 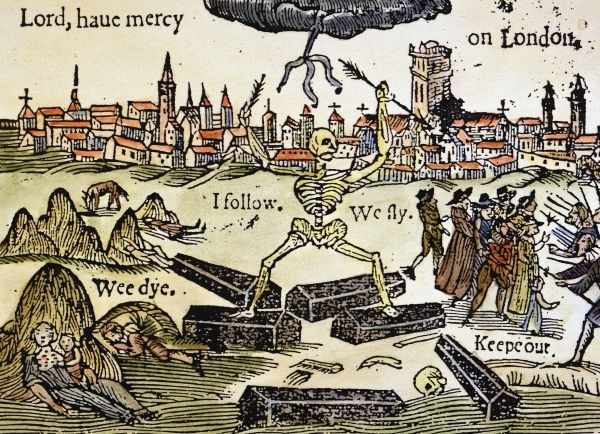 The arrival of the Plague and it’s rapid spread through the city of London in 1665 is one of the first major outbreaks for which we have a wide range of contemporary accounts and records. Unlike the Black Death, we can see administrative files covering the parishes and their losses. These were published on bulletins, giving us a picture of where the Plague spread and clues as to what led to higher or lower death rates. The Great Plague also provides us with a lot of contemporary evidence about peoples beliefs about the cause of disease. Illustrations, books and official records all point us at a variety of attempts at preventing the spread of the disease, to the treatments that were attempted and to the attitudes of society towards the plague of the time. This activity can be done by KS3 students, though was initially created for a GCSE class. It takes some of the data and asks students to interpret it. Broadsheets are used to ask pupils to identify features of the news and to infer what this tells us about beliefs and attitudes at the time. Data is extracted from the broadsheets and made a little easier for students to read. They are then asked to look at the data alongside other sources of information, including Pepys Diary. Questions look at the evidence of superstition, scientific methodology and the reliability of contemporary records. The data itself is used to create a chart, this element can be used to compare the impact of the Great Plague with later outbreaks of diseases such as Cholera.